Just what you were looking for: The intersection of a horrific tragedy, the perpetual immigration debate, San Francisco Sheriff Ross Mirkarimi, and the presidential ambitions of Donald Trump. And just this afternoon Mayor Ed Lee waded into the debate over San Francisco's immigration policies prompted by the shooting death of 32-year-old Kate Steinle on the city's Pier 14 last Wednesday, allegedly by a man with multiple felonies on his record who had been deported to Mexico five times. "There has been much discussion about San Francisco’s Sanctuary City Policy in the aftermath of Kathryn’s death," Lee said in a statement. "Let me be clear: San Francisco’s Sanctuary City Policy protects residents regardless of immigration status and is not intended to protect repeat, serious and violent felons." The city's sanctuary policy stems from a 1989 ordinance prohibiting city officials from assisting in federal immigration enforcement unless required by law. "I am concerned about the circumstances that led to the release of Mr. Sanchez," Lee continued. "All agencies involved, Federal and local, need to conduct quick, thorough and objective reviews of their own departmental policies and the decisions they made in this case." The case is engendering national headlines. CNN, for instance, led with the story on its website Monday, promoting it with the question: "Did sanctuary law lead to slaying?" 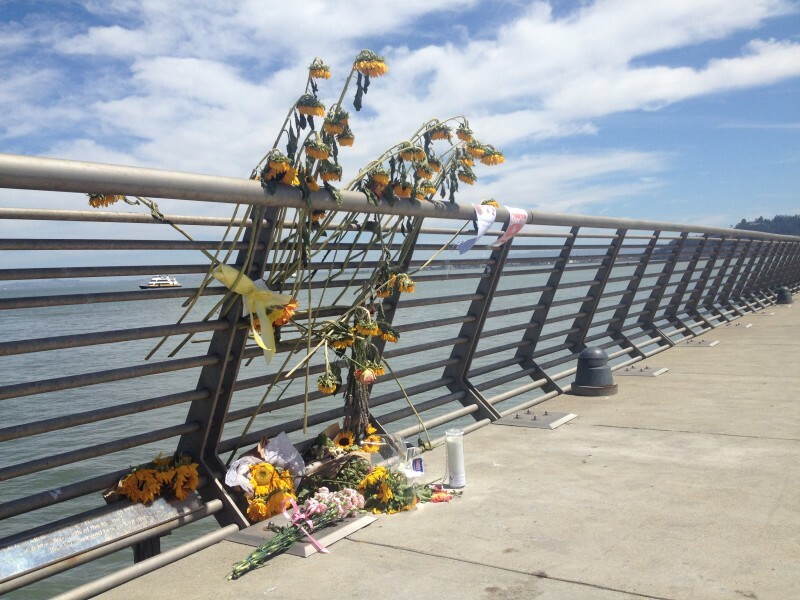 The debate takes place in the aftermath of the July 1 shooting, when 32-year-old Kate Steinle was fatally struck by a bullet while walking with her father on San Francisco’s Pier 14, near the Ferry Building. "There was a pop, and Kate went down,” her father said, according to news reports. Steinle died later that day at San Francisco General Hospital. Shortly after the shooting, which police said appeared to be random, a man named Juan Francisco Lopez-Sanchez was detained and then jailed on suspicion of murder. In a somewhat disjointed jailhouse interview with ABC7 over the weekend, Lopez-Sanchez, who didn't appear to always understand the reporter's questions in the interview's raw version, confessed to the shooting, saying it was an accident and that he found the gun wrapped in a T-shirt. The San Francisco Chronicle had earlier reported that he told police he was shooting at sea lions. The San Francisco District Attorney's office charged Lopez-Sanchez with murder on Monday afternoon. News of Lopez-Sanchez's immigration status and criminal history has opened up a can of worms around immigration and criminal justice. U.S. Immigration and Customs Enforcement says Lopez-Sanchez, from Mexico, has been deported five times, most recently in 2009. His criminal history includes seven prior felony convictions, four involving drug offenses. That history did not prevent him from being released from county jail in San Francisco in April. Enter Donald Trump, who in June launched his presidential campaign with a tirade against immigration from Mexico. “They’re sending people that have lots of problems and they’re bringing their problems,” Trump said. “They’re bringing drugs, they’re bringing crime, they’re rapists, and some I assume are good people, but I speak to border guards and they tell us what we are getting." The comments cost Trump a multitude of business partnerships, including those with Macy's, NBC Universal and Univision. Undeterred, he repeatedly defended his remarks and last week used the San Francisco shooting to justify his views. "This senseless and totally preventable act of violence committed by an illegal immigrant is yet another example of why we must secure our border immediately," Trump said. "This is an absolutely disgraceful situation and I am the only one that can fix it. Nobody else has the guts to even talk about it. That won't happen if I become President." So how and why was Lopez-Sanchez released? U.S. Immigration and Customs Enforcement spokeswoman Gillian Christensen said in an email that in March, Lopez-Sanchez finished serving a federal prison sentence at Victorville for felony re-entry to the U.S. after being deported. After that, the Bureau of Prisons transferred him to the San Francisco County Sheriff's Department "based on an outstanding arrest warrant lodged by the San Francisco Police Department for a felony drug charge." When ICE received a notification that Lopez-Sanchez had been booked into San Francisco custody, Christensen said, it sent a request for an immigration detainer "asking to be notified prior to his release." "Bottom line: If the local authorities had merely NOTIFIED ICE (ICE emphasis) that they were about to release this individual into the community, ICE could have taken custody of him and had him removed from the country - thus preventing this terrible tragedy. At the end of the (sic) ICE desperately wants local law enforcement agencies to work with us so we can work to stop needless violence like these in our communities." The San Francisco Sheriff's Department, for its part, said its hands were tied. "Once Mr. Lopez-Sanchez’s local criminal charges were dismissed, " the department said in a statement Friday, "San Francisco Ordinance 130764, approved by the Board of Supervisors and signed by Mayor Ed Lee in October 2013, deemed him ineligible for extended detention. This also comports with the San Francisco Sheriff’s Department Policy on immigration detainers." That cited San Francisco ordinance says: "A law enforcement official shall not detain an individual on the basis of an immigration detainer after that individual becomes eligible for release from custody." In addition to San Francisco's ordinance, in 2013 California passed the Trust Act, introduced by then-San Francisco Assemblyman Tom Ammiano. The act prohibits law enforcement from holding someone on the basis of a request by ICE after the person is eligible for release, unless he's been convicted of a serious or violent felony, a felony punishable by imprisonment in the state prison. or certain serious misdemeanors. On Sunday, the Chronicle's Carla Marinucci wrote a piece on potential fallout from the incident in the Bay Area and California. At the state and local levels, political figures who have been associated with efforts to advocate for immigrants in the law enforcement arena may also face heat. Heading that list is Kamala Harris, California’s Democratic attorney general and a former San Francisco district attorney. She’s widely considered the front-runner to replace retiring Sen. Barbara Boxer — and her record on immigrants and law enforcement has long been fodder for conservative critics. Sheriff Ross Mirkarimi, up for re-election in November, and former San Francisco Assemblyman Tom Ammiano, who may mount a run to replace termed-out state Sen. Mark Leno next year — may also have to answer questions about their roles in shaping the policies that led to Sanchez’s release. "Federal courts, including the Oregon federal district court in Miranda-Olivares v. Clackamas County ... have held that ICE holds are not only voluntary, but that the detention of individuals based on ICE hold requests violates the Fourth Amendment prohibition against unreasonable search and seizure. ICE holds violate the Constitution because they are not signed by a judge and are not based on a finding of probable cause. Rather, they are issued by only ICE agents, and have been issued on individuals who are not actually removable." Chan says ICE's contention that the Sheriff's Department merely had to inform ICE that it was releasing Sanchez-Lopez is disingenuous. "If they wanted to detain Mr. Sanchez, they should have gotten a warrant signed by a judge ... ," she told KQED. "They issued an ICE hold request and they know full well an ICE hold request violates the Constitution." "(B)ecause compliance with an ICE detainer is voluntary, a local agency could violate the Fourth Amendment by detaining an individual solely based on the request of ICE, without some other probable cause for arrest,” the bulletin said.